The company has grown to around 2,800 employees in 29 offices around the globe, who work on some of the world’s most remote and exciting projects, and Ausenco is strategically positioned to capitalize on expanding opportunities in global markets. As it has grown,Ausenco has learned the value of customizing its services to meet evolving industry needs, and of partnering with the world’s best providers in each field. In 2003, it established its Ascentis division to deliver specialized operations solutions to the minerals-processing industry. Five years later, in 2008, it made three significant acquisitions: Pipeline Systems Incorporated (the PSI group), Sandwell International Inc., and Vector Engineering Inc. Recognized as a world leader in the design and delivery of slurry pipeline transport systems, PSI brought to Ausenco global expertise in innovative materials-handling and control systems. PSI also extended Ausenco’s global network of offices, particularly in South America. As a specialist in ports and bulk materials-handling systems, and in energy and industrial processes for the mining, oil and gas and other heavy resource industries, Sandwell further expanded Ausenco’s suite of services. With offices in Canada, the USA, South America, Asia and Africa, it also extended the Australian company’s geographic reach. Ausenco’s third acquisition, the California-based Vector Engineering, contributed specialized geotechnical, civil, environmental and water resource services. In the years following these major acquisitions,Ausenco went on to form alliances with Whittle Consulting and Meteng — specialists in business optimization for the mining industry. It also acquired 50% equity in the Kramer Group, a project management and engineering services group operating in the south-west Pacific. And, in 2012, Ausenco acquired the Calgary-based Reaction Consulting oil sands company, formed an alliance with South African-based water treatment specialists, Proxa Ltd, and acquired Australian-based asset and logistics experts, the Rylson Group. Following on from these acquisitions, in 2013 Ausenco acquired another Calgary-based oil sands company, PROJEX Technologies, to further strengthen its capabilities and service offerings to its clients in this area. Today, these strategic partnerships make Ausenco a total solution provider to the global resources industry, able to provide a full range of infrastructure and engineering services. This article will focus on a few of Ausenco’s recent projects, relating in particular to the subject of coal handling. Ausenco does not manufacture equipment itself, but it offers custom designs of conveyors, stackers and shiploaders (selected single or dual quadrant shiploaders). It can also select a manufacturer for local fabrication. Currently,Ausenco has several coal projects in progress and/or recently completed in North and South America as well as Australia, Namibia and Africa. Ausenco offers the full range of services from planning concepts, prefeasibility, bankable feasibility, detailed design, EPCM (engineering, procurement, construction management) and sometimes EPC with a construction partner. 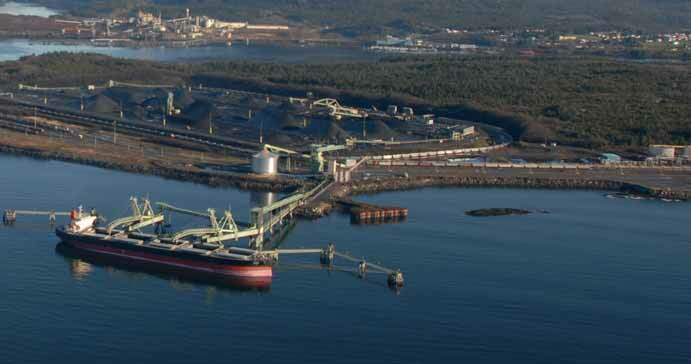 Major company clients include: Rio Tinto; BHP Billiton & BMA; Anglo American; Xstrata Coal; Glencore; Peabody;VALE;Teck; Western Canadian Coal; Dalrymple Bay Coal Terminal;Westshore Terminals; Ridley Terminals; Neptune Bulk Terminals; and Stevedore Services of America. Recent technological developments include: v advancements in computer simulation modelling; v use of DEM (discreet element modelling); v civil, structural, project management; and v finite element modelling (FEM). Maintenance Improvement Project (New South Wales, Australia) Ausenco Rylson was engaged to drive the implementation of a Maintenance Improvement Project (MIP) across two underground mines, five open cut mines and four coal processing plants operated by Anglo American Metallurgical Coal. Ausenco Rylson delivered: v optimized maintenance strategies for all critical assets; v operational budgets (OPEX) for all critical assets; v critical spares requirements for each site; v workload profiles for each site; and v total cost of ownership (TCO) models for critical assets. The project required a large on-site team as well as back office support to deliver within the specified timeframes. Maintenance strategies were optimized using a facilitative workshop approach. Significant input from client personnel ensured project buy-in as well as development opportunities for client staff. TCO models for all critical assets were developed using Ausenco Rylson’s enterprise-grade asset management tool, Rylson8. In excess of 150 asset types were analysed during the process. Maintenance strategies were optimized and revised strategies implemented across all sites. Full lifecycle costs and resource profiles were established for each mine site, highlighting high cost assets. This allowed the organization to define a replacement strategy for the high cost assets and quantify the cost savings. Ausenco Rylson succeeded in transitioning the organization away from traditional top-down maintenance budgeting to zero- based budgeting by ensuring maintenance budgets were fully justified and transparent. The organization as a whole benefited from increased knowledge of Reliability Centred Maintenance (RCM), reliability engineering, activity based budgeting and lifecycle costing. construction of a port and materials handling facilities. The project pioneers access to the Galilee Basin coalfields and incorporates the largest scale, single coal production facilities in Australia. Production capacity is scheduled to expand from opening production levels in 2014 of 30mt/year (million tonnes a year) to 60mt/year by 2019. In a JV role with WorleyParsons, Ausenco and Worley combined to deliver ‘programme management contractor’ (PMC) services, accountable as the owner’s representative, to manage project delivery. The contracting strategy incorporated an early contractor involvement (ECI) process, leading through to a formal tender process and award, followed by, management and closeout and for functions associated with project delivery. The PMC was also accountable for HSEC (health safety environment and community) management, construction management, project controls, quality management and commissioning services. In Phase 1 of the project, the PMC was required to support the owner’s development of a bankable feasibility study. Most importantly, the ECI process was designed to deliver inputs to a contract-based estimate for execution of the project which underpins financial approval applications. Ausenco’s objective was to deliver the project at a value equal to, or lower than the contract based-estimate. v Phase 1 concluded at the point of financial approval. v Phase 2 was the implementation, construction and commissioning phase. The owner required to operate this plant from a remote operations centre several hundred kilometres away from the site, which introduced some unique challenges in automation and the application of cutting-edge technologies. The plant site is located in an area where black soils presented unique construction challenges and a degree of seasonal variability in access conditions to work areas. For example, in January 2011 the minesite and surrounding areas were isolated by floodwaters. Xstrata Coal Queensland engaged Ausenco to evaluate and optimize the Surat Basin Coal Chain. This supply chain will take coal from the proposed Wandoan mine to marine terminals at the Port of Gladstone and Port Alma. The key analytic tool developed for this analysis was a simulation model of the entire supply chain. The model included the proposed Surat Basin rail line, the existing Moura, Blackwater, and North Coast rail lines, eighteen mines, five types of trains, four coal export terminals, and two ship access channels. The model reported the operating cost for several scenarios, quantified the benefit of extra infrastructure, and was used to determine the optimum expansion pathway over a multi-year ramp up of coal production. The project was completed in five months by a team of bulk handling, rail, and simulation specialists using Ausenco’s Transportation Logistics Simulator software. Ausenco utilized its operations and maintenance expertise to significantly improve the plant production at Isaac Plains CHPP plant (see picture on p127). After taking over the O&M (operations & maintenance) of the plant from another provider, Ausenco O&M specialists concluded that the feeder breaker (crusher) equipment was undersized, thus increasing failure potential and preventing the plant from reaching its design capacity of 500tph. The crushing equipment was the cause of regular failure at the plant thus reducing the annual throughput of saleable product. Ausenco’s engineering specialists concluded that the equipment required upgrading to allow it to provide the necessary crushing capacity. optimization adjustment and maintenance for the upgraded crusher. reduced wear and stress on crusher components with revised maintenance routines resulted in decrease in maintenance costs for the crusher by 50%; v crusher has not failed since the upgrade; and v improved plant availability and production for CHPP operations. a computer-based terminal operations management system. The terminal is located on a rock site, which presented significant design challenges, especially for the marine foundations. Ausenco Sandwell provided full EPCM project management services for the coal handling and ancillary facilities, including all design, time and cost control, procurement, expediting, scheduling, reporting, construction management, quality assurance and commissioning.